Garden coordinators (L to R): Judy Funderburk, Alyssa Ford Morel, Elaine Mills, Paul Nuhn, Wendy Mills. The Glencarlyn Library Community Garden, one of the demonstration gardens maintained by Master Gardener volunteers and interns from the Arlington/Alexandria unit of Virginia Cooperative Extension, is now under the leadership of five coordinators: Paul Nuhn, Alyssa Ford Morel, Wendy Mills, Elaine Mills (not a relation), and Judy Funderburk. Paul, a longtime resident of the Glencarlyn neighborhood, is jointly responsible for the rejuvenation of the garden. He and fellow Master Gardener Judy Funderburk began care of the garden in 1999 after the original garden, a Boy Scout Eagle Project of the early 1990s, had fallen into disarray. Paul has introduced many exotics, such as bananas and various Asian species, into the garden and enjoys bringing a touch of whimsy with various impromptu art projects. His expertise in pruning is invaluable to the maintenance of our trees and shrubs. On Saturday mornings throughout the growing season, he can be found at the Courthouse Farmers’ Market dispensing gardening advice to the public at the Master Gardeners plant clinic. Alyssa was invited to join Paul and Judy as a third coordinator after her certification as a Master Gardener in 2013. She now has a strong knowledge of the garden’s many plants, especially our native species, and her training as a Master Naturalist allows us to be more aware of visiting wildlife, particularly birds and pollinators. Her organizing skills are critical in the planning of our two major annual events, the spring plant sale and AutumnFest, and her culinary talents are frequently enjoyed by volunteers at weekly work parties during the growing season. Alyssa also participates regularly in propagation activities in Arlington County’s native plant nursery and is a leader in the local Audubon at Home program, which encourages residents to make their yards more supportive of wildlife. 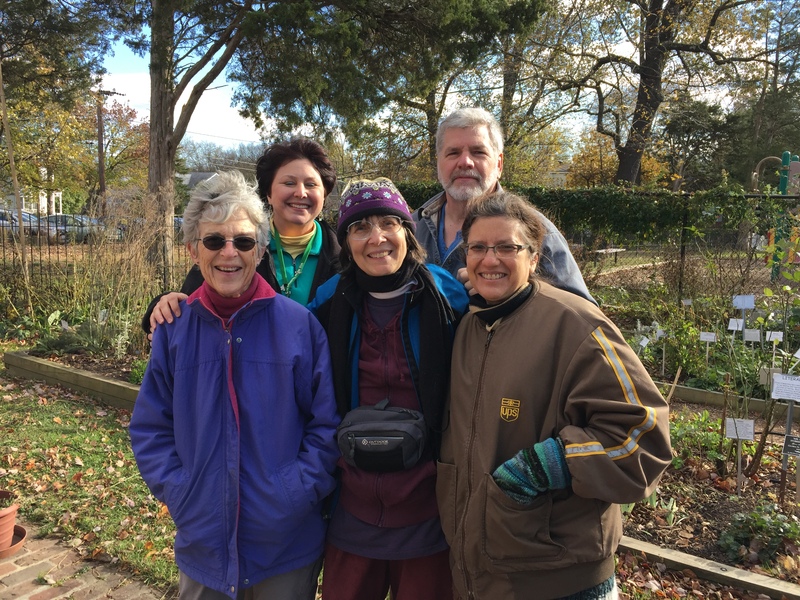 Wendy, a member of the Master Gardener class of 2013, joined the team of coordinators in 2017 after Judy decided to step back from her leadership role. Wendy’s background of work at The Nature Conservancy gives her a global environmental view, and her strong interest in sustainability and native plants is reflected in the design of her home garden, which won the Garden of the Year award from the Rock Spring Garden Club in 2010. Wendy also enjoys vegetable gardening and participates regularly at the Organic Vegetable Garden, another Arlington demonstration garden. Her attention to detail helps keep the team on track with deadlines and weekly posts for our work parties. She is especially interested in new educational initiatives for the garden that will help our visitors learn more about native pollinators, weed identification, and the importance of removing invasive plant species. Elaine, a classmate of Alyssa’s from the 2012 Master Gardener training class, also joined the team in 2017. She has a special interest in native plants and was responsible for creating the first set of fact sheets on selected tried and true species which are now posted weekly on this web site and on the MGNV Facebook page. Her passion is photographing plants at regional gardens in various stages of growth throughout the year. She also enjoys attending lectures on sustainable gardening and then sharing her newfound knowledge in articles, web site postings, and public presentations. She plans to continue weekly photo postings on the Glencarlyn Garden’s Facebook page and to work on new educational signage for our visitors. Although she has stepped back from the heavy administrative responsibilities associated with the garden, Judy, an emeritus Master Gardener, is still very much involved in the hands-on aspects of maintaining this special space. She regularly attends the weekly work parties from March to November, warmly welcoming each new class of Master Gardener trainees, and often provides delicious treats made with herbs from the garden. Her mentoring guidance continues to be critical in planning events and developing new projects. Judy’s in-depth knowledge of the garden’s plants, especially those with herbal uses or which support wildlife, is readily shared with all visitors. She derives special pleasure from introducing the joys of gardening to our young neighbors at the Carlin Hall preschool. This entry was posted in Demonstration Gardens, Glencarlyn Library Community Garden and tagged Garden coordinators, Glencarlyn Community Library Garden. Bookmark the permalink.